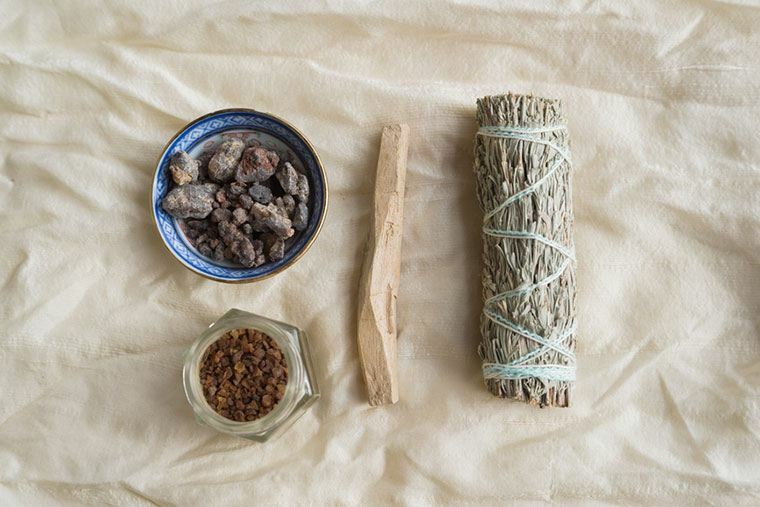 From sage-ing your new apartment in the hopes of clearing negative energy to burning palo santo and other healing herbs as part of your self-care Sunday routine to try to lift your spirits, smudging has become the go-to method for the wellness-savvy set to reach #goodvibesonly status. And now, herbs like sage, cedar, juniper, sweetgrass, and palo santo aren’t just for your home—they’re the latest thing in skin care as well. Why? According to Mashell Tabe, an Albuquerque- and New York City-based medical esthetician, they’re anti-inflammatory and have anti-microbial properties, plus they’re loaded with antioxidants, so it’s no wonder they’re popping up on ingredient labels left and right. “It’s the combined synergy of the healing ingredient from the earth and your energy field that brings in the clearing,” says Tabe. By setting the right intention, you can easily transform your skin-care habits into rituals. To do so, she recommends becoming heart-centered before applying your toners, serums, and moisturizers. Start by taking a deep breath while thinking of someone or something you love to open the channels of your heart. Then, imagine your energy traveling from your heart out to your shoulders, down your arms and coming out of your hands infusing the products you’re about to use with love. Take a moment to bless the ingredients, giving them the ability to bring about rejuvenation for your skin, and apply mindfully. Keep scrolling to shop ritual-making skin care. A blend of essential oils including sage, lavender, chamomile and jasmine help to calm your skin and relax your mind in order to prepare for a good night’s sleep. Spritz it lightly across your face (and onto your sheets) before hitting the pillow. This body wash is comprised of saponified coconut, jojoba, and olive oils along with white sage essential oils, which have been shown in studies to contain antimicrobial properties. This palo santo-spiked body oil comes with a stick of the wood right in the bottle, making it an intoxicatingly scented elixir that stays good to the last drop. Its base of sunflower and safflower oils gives the formula a lightweight texture, perfect to be applied after a meditative nightly bath. Clary oil, derived from the clary sage plant, is the hero ingredient in this facial oil. Massage a few drops into your skin as the first step to your skin-care regimen after cleansing for complete nourishment as often as needed. This deodorant uses a combination of powders and essential oils like palo santo to counteract odor. The unique gel-to-powder formula allows your skin to breath while giving off a woodsy scent with a hint of spice. This super-simple cream contains four ingredients, one of which is juniper, shown in some studies to contain anti-inflammatory properties that might make it good at dealing with inflammatory skin conditions. If you’re more of a traditionalist, here’s Latham Thomas’ tips on clearing your space and here’s how Elle MacPherson smudges in her home.